Technology and the way online marketing work are always changing. Keynote speaker and digital media consultant Patrick Allmond talks about the five levels of digital marketing which has impacted the way that we go about marketing ourselves to the world through digital media. He enumerates it as the different levels of disruptive digital marketing as such: you’ve got to have a website which is up to date, you’ve got to productize your knowledge, you’ve got to generate leads, create consistent content, and then buy ads to drive traffic to your site. Learn about all these in detail so that you can put this stuff into action and produce wonders for your business. 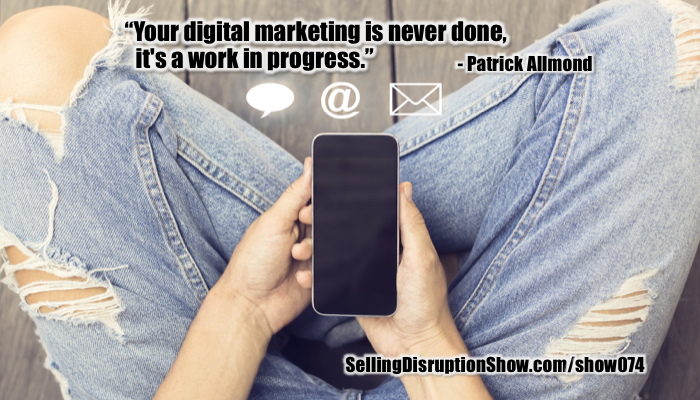 My guest on the show is Patrick Allmond of Focus Digital Marketing. He founded this company in 1998. He is a recognized leader in the online marketing industry. He is a veteran, a professional keynote speaker, and a pilot. He’s been a frequent consultant for ABC, NBC, CBS, Fox TV, and other media outlets when it comes to digital media. He is also my guru when it comes to figuring out the digital aspect of online marketing. Welcome, Patrick. Thank you. I am excited to be on your podcast. This is a popular show. It’s going to be hard to get in the door pretty soon to talk to you. The reason why I invited you on the show is to talk about your five levels of digital marketing, which has impacted the way that I look at how we go about marketing ourselves to the world through digital media. Let’s walk through your five levels or five phases of digital marketing. Let’s make sure that our audience understands why it’s so important for us to do a checkup about how we do this and make sure we get them in the right sequence. I like the way you put that because a lot of these things are common sense, common knowledge, but it’s good to start at the top. These are things that are almost never completed. They’re things that are versioned. We have to make sure we go back and revisit them because technology and the way online marketing work are always changing. As long as they keep changing, I’ll have a job out there. The first one is the website. This seems like common sense, but it’s important these days to revisit your website, look it over, make sure it’s on the latest technology, and it’s modernized. It has the things that Google is looking for to make sure it’s mobile-friendly. The website to me is often taken for granted thing. People just assume that it’s always out there and never needs to be updated. That’s not true. Website quality changes. The expectations and the experience change. Most websites are viewed on mobile devices and any website that was done for more than two or three years ago looks awful on the current mobile devices. There are things like mobile usability and other things that Google takes into account. Even though there are millions of websites out there, you want to make sure that your website is optimized to the point where Google ranks you highly. One of those is mobile usability. Google is able to look at your website, it scans it and says, “This is not going to work well on a mobile device,” or, “This is tuned well.” In addition to mobile usability, Google’s looking at things like speed. How fast is your website? If you’re showing some old hosting, it takes a while for your images and other texts to come up and your videos to play, that diminishes your ranking inside of the Google Search engine. The whole idea is Google wants to serve up results that make people keep coming back to Google to use them as a search engine. They’re going to serve up results that provide the rapid access and usability that people want. They’re not going to recommend any site that’s going to degrade the Google experience because it is seen as being the authority. I even noticed that a while back, for example on my own business, that once I started getting better hosting over years, I’ve improved the hosting experience on some of my websites. My Google ranking slowly goes up over time. There are several key phrases now where Google even has my search results as the default result because my website has responded the fastest for certain keywords. Readers, you have to go and take a look at your site through your mobile device. Figure out if it’s loading slowly. A single second increase in load time can decrease the responsiveness of the viewer by 11%. 1% of the people will abandon if they have to wait one second longer and this is crazy types of situations. The one last thing we should cover here is the importance of an SSL, which, in layman terms, is what makes your website secure. It used to be that the only time you had to worry about security on a website is when you were going to be taking someone’s personal information or credit card information. Google decided a while back that this is going to be a ranking factor. The secure websites are considered more genuine and take a little bit more work, but Google is using that now as one of those thousand little switches that affect the ranking. If you go to your website in the upper left-hand corner and you’re not https, get with your web person as soon as possible and get that resolved. It’s a quick fix. It can be done in about a day, but it can have a drastic impact on how well you ranked compared to your competition. Tune up your website and your landing page. Make sure that it’s targeting your right audience and it’s not a repetition of your brochure. That’s level one. When I presented level two to a person, I say, “People are begging to buy from you. Don’t disappoint them or productize your knowledge.” Your company likely has some deep history and you know your industry very well. You may not talk about it. You may talk more about the widget that you sell. You need to realize that all the background information about that widget, how you build the widget, the best way to use that widget and what the competitor’s widget does versus yours, all that knowledge after, you’re going to turn that to some training program or a product. Every company has the availability to do this, to share their information. It’s not just people who sell intellectual property. As a musician, one of my favorite websites is Stewart-MacDonald. They sell the tools to build and repair guitars and the parts. As a Luthier Guitar aficionado, you can keep your instrument in tune. They sell all kinds of information in packages. They give away a lot of video information about how to get started, but if you want to go deep, you’ve got to pay. While their business is to sell tools, they also sell knowledge. This makes it easy for Google to figure out that this is a great site for you to go if you’re trying to learn about something. There is a big thing in the world now called content marketing. Content marketing is you sharing your knowledge and your wisdom. Even in small fine tune, you may think that you always have to share the big massive concepts, the big picture. For example, there is some difference in guitar strings, in wood, or in how you build something. There are all kinds of detailed information that affects how a guitar sounds, the timbre of it, how it reverberates, high-quality strings versus low-quality strings, all those micro pieces of information that people want to hear about. Especially those tone chasers like me, who are trying to get that killer sweet tone that gives you goosebumps. There are a thousand things that you can adjust, the strings being one of them. There are a lot of ways to satisfy those of us who are passionate about something. Let’s talk about what productizing might be like. For example, I’m working with a company here that deals with heavy lifting objects. They make this vacuum pump system that allows people to attach this to front-end loaders or backhoes to lift up things. They have to talk about that vacuum product that may lift it up. However, what they can do as opposed to just selling that widget is maybe they have a training program to teach people how best to use that. How to install it, how to use it to lift different things, what it looks like on the job, how to deal with repairs on it, how to have a training and a certification program so you are recognized as someone who knows how to use that particular vacuum pump better. There are so many different ways where you can lay out your knowledge in almost like a course format where you’re like, “Here’s Module A, the beginning section. Here’s Module B, the intermediate knowledge, and here’s Module C.” Inside one of those modules, you have some lessons that say, “Here are some short video segments. Here are videos one through five in the beginning section. Here are videos six through ten in the intermediate section. Here are videos eleven through fifteen in the advanced section.” Then maybe by the time somebody gets done watching all the videos, they’re not only an expert on the widget itself, they’re an expert on how best to use it. They’re an expert on how not to use it and how you can use it to grow your business and be more productive with that particular piece of hardware. Your website is a sales side if you do it right. 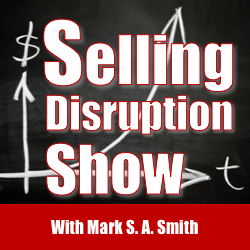 The whole idea behind sales is to reduce a person’s perceived risk of doing business with you. That happens through education. If they can see themselves using your product or your service, if they can feel like you can be a part of their lives and contribute to their objectives, you can do so in a riskless way or as low risk as possible, then they can buy. This training is part of the strategy to reduce their perceived risks. The more we know, the more confident we become. Productizing knowledge can substantially speed the sales cycle of your products when you do this correctly. Offsetting the risks increases the trust and we are all more likely to do business with the people that we trust. That’s the second level, productize your knowledge digitally. What the next level? The third level is called lead generation. If we’re talking about building a website, people coming from the direct mail world who love to build their website as an online brochure. You go there, browse it, look at the images, and then you cross your fingers that someone goes to your contact page and calls the phone number or fills out a contact form. 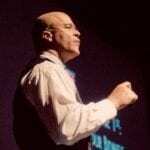 I like to teach people to be a little bit more aggressive with that on every page or via popups or via a variety of lead generation methods to be pushing people to take that next step in advancing the relationship. I like to build every website with lead generation tactics in mind, whether it’s a free download in exchange for an email address or whether it’s text in to get this freebie right now. We want to advance that relationship as much as possible, so your website needs to be lead-generation oriented. The whole idea behind getting more sales is to have more conversations digitally or with a human being. The way that we have to get more of these conversations going is to identify those people who are most likely to need, want, desire, what it is that you’re selling. When I’ve done my research in the past with executives and said, “When you have to solve this particular problem that I was researching, where do you start? The answer ubiquitously was, “I google.” Now, we’re starting to make that pivot of, “I ask Siri,” or “I ask Alexa.” With these ways that they search, they need to find you. Then you need to exchange some valuable information in exchange to start that conversation. What is the best way to generate leads given this approach? The simplest way to get started is to offer somebody a free download. More often than not, we see websites that say, “Sign up for my newsletter.” That is a horrible lead generation tactics. I don’t think anybody wants any more newsletters. I’ve got enough email. I don’t know about everybody else. I like to give a free download away or maybe a free short video series of some sort, “Give me your email address. I’ll send you this video of the top five ways that you can use our product to increase your revenue, increase your bottom line or to decrease the risk in your business.” The videos are very popular online. Most people are willing to give up their email address in exchange for a video and that’s level one of lead generation. Level two is offering someone a series. This is something I’ve seen you progress into, Mark. It is where someone fills out something and they don’t just get one thing, they get several things over time. We can tell if they engage with those things over time, what their interest level is. Maybe one thing for someone is to give us their email address. They’ll watch a video and we’re one and done. If you send someone five videos over a two-week period and you know that they are watching, clicking and opening every single video, you know that person is highly interested. You’re going to treat that prospect differently than you would at someone who just opened up your free PDF and read it quickly then completely forgot about you. The idea here is we provide information in a way that we can let a person let us know how interested they are. Therefore, we can figure out their propensity if they’re going to do business with us or not, which allows us to trigger the engagement of our sales team or other methodologies to get things going. This is the whole idea behind disruptive digital marketing. You have to do this. You have to build and design this in a completely different way than we did traditionally when we were mailing things or putting ads in newspapers, TV shows or magazines. It’s a different approach. Keep in mind that you are not your target audience. You might be thinking, “I would never respond to that.” It doesn’t mean that your target audience, your target market won’t respond to it. In fact, they probably will. It’s the reason why we know these things. How do we figure out what’s the best way, what’s the best methodology for us to engage with our prospects? One of the best ways I’ve seen is marketing automation to where you can automatically measure the views, the clicks, and the opens that people are doing. I’m a big fan of marketing automation and building a series to gauge someone. Then take the highly interested prospects down a different path than the someone who’s casually interested. There are tools out there like Infusionsoft or HubSpot that help you measure the interest level of someone because not all prospects are created equal. Hopefully, your CRM or your system where you maintain your prospect information gives you a way to rank those prospects. Traditionally, that’s something we’ve had to do manually either by mailing them something manually, getting on the phone with them, having conversations with them, talking to the other sales staff, and see what they know about them. In this day and age, in the electronic world, we can measure all that digitally. We can measure if we send someone a ten-minute video. Did they watch 30 seconds of that ten-minute video or did they watch the entire ten-minute video three times over? Those people need to become different prospects inside of our CRM. In this day and age, we can use a lot of different cool digital tools to measure the interest level of what people are doing online. 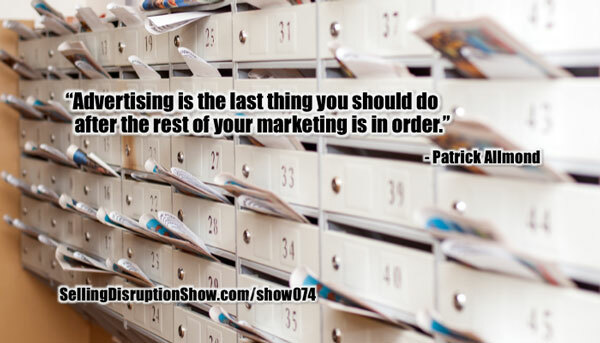 I heard one person say that if you’re not using marketing automation, you’re on your way out of business. I have to agree with that. You have to figure out some way of providing your customers the interaction that they want at the time they want it. People buy 24/7. People buy at 3:00 AM when they wake up. They have an idea and they immediately take action. We have to be able to respond to them and figure out the best way to interact and communicate with them if we’re going to survive against competitors who are doing that. Digital marketing is extremely disruptive. You’ve got to play and when you do, you can start disrupting. I talked to my people to communicate using different modalities. Some of your leads are going to want to read texts. Some of them are more visually-based. Some of them don’t want to watch videos. Some of them want to get an email or a text. It may seem like a lot of work to invest in these different ways. My company a while back started investing in SMS marketing and I’ve got leads now that I communicate with who don’t ever email me. They don’t ever call me. I close entire deals via texting. When you’re building those leads, in addition to asking their email address and name, you might also ask them for their cell phone number. You can come up with a way to SMS them. You have to go where your leads are and make sure you are communicating with them in the best form possible. This means lots of different ways for them to play. It feels overwhelming, it’s the cost of entry to the marketplace now. That’s level three, generating leads. What is the next level? The next level in simple terms is called content marketing, but I call it using your expertise, using your knowledge to build trust online. We were talking about turning your knowledge into products. This is another way of saying that, but this is something that you have to do on a regular basis. You often hear that you should be blogging more, producing YouTube videos, Snapchat, or Instagram things. The end result of all that is to demonstrate your expertise and that is called content marketing. It builds the trust factor up, but it also is as far as Google’s concerned, when you’re updating these things more, you rank higher for your particular search terms. When you rank higher, you get returns more. You show up higher in the search results. I tell people that, “You should be building content on a regular basis.” The fact that we’re talking on your show is one of those cases where the people hear the podcast that you’re doing, so you’re going to be a recognized person in your industry. You’re sharing your knowledge. You’re bringing in the experts who know what they’re talking about. Mark knows the right people to connect with to make sure that his audience knows that working with him is a low-risk business. The show is a form of content marketing. We’re going to be doing a show in podcasting very soon and how executives can use podcasts to put themselves out ahead of the competition. My podcasts get more interaction and more readers than anything else that I do by a factor of ten. It’s because executives listen to the podcast when they commute on the airplane, or in their cars and as they work out. It’s a very different approach. If this podcast was targeting a different audience, we might do it as a video, but my audience does not watch video. Whether it’s blogging, which is good for SEO, doing a video work, which works better for me because I don’t think I’m that great with the written word or podcasting or a short form video. The Snapchat and the Instagram videos, the long form videos, which may be a half-hour YouTube video. There so many ways to produce content nowadays. You need to make sure that you’re doing it on a regular basis, and if you can do it with the lead generation, in different formats for your audience to consume. You were talking with a brilliant lady, Jill, we talked about repurposing your content. That’s something I try to do when I do my videos. I try to strip out my videos into my podcasts and into other things. If only you’ve got the staff and time for it, try to approach it in different ways, text format, podcast format, and video format. You can catch people at their desktop, in the car, on Spotify, on that device that sits over the corner of your house that you speak to. The whole point here is that we can create content, we can chop it up in multiple ways. We can format it in lots of different ways. You want to create this machine where a piece of content gets generated. It can be as simple as a podcast interview right here. Then, that can get chopped into pieces such as a video segment where somebody puts it over a graphic with some music or a meme that gets posted on Twitter. Also, it can get chopped into bite-size chunks that go out as text messages. There are so many different ways that we can reformat content once it’s generated. One of the things I want to make sure my readers get is consistency. It’s consistent content production that proves expertise. You have to have that cadence. That’s why this is a weekly show. Sometimes I’ve taken breaks and my readership falls off because people forget about it. You have to constantly remind people that you’ve got good stuff available. When I’m producing a lot of content and when I’ve taken long breaks, it’s obvious in the traffic charts right there. “Patrick did four podcasts this month or cranked out four podcasts and four blog posts,” the traffic goes up. Google is looking for things that are recent and relevant on your website and will reward you appropriately. We’ve talked about content marketing as the fourth level of disruptive digital market. Let’s go to the fifth. The fifth one is we see that people like to jump in too early sometimes versus all the other four. It’s something that should only be done once those other four are in place. That’s what I call investing in paid marketing platforms. Most people on the Internet who are producing content, whether it be a long form or a short form text, audio, or video, we realize that we get to produce this content and upload it to places for free. We can produce a video, we can upload it to YouTube, to Facebook, create a podcast and upload it to a podcast hosting company, for Mark to share it and it’s free. However, to take it to the next level, once you’ve got all those other things in place, you start looking at the paid platforms like Google Ads, Facebook ads, or AdRoll to escalate the free traffic that you’re already getting. Some great examples of this are if you’re doing a regular weekly podcast and it’s generating traffic to your website, people who are interested, they return over and over, then you can target those people. You can display some ads to them that say, “Let’s take it to the next level. Go here, get my free download. Let’s escalate that relationship.” They already trust you from the content you’re producing. Now, you want to get them into that funnel. We do that by putting ourselves in front of more people. A lot of people lead with paid marketing when they don’t have a good place for people to land. You have to make sure your paid marketing over delivers on the promise of the marketing if you’re going to make that paid advertising worth your effort and time. One of the consistent mistakes I see in people who jump into paid marketing too early is they run an ad and send someone to the home page of their website. This is not only a pet peeve of mine, but that’s a good way to waste money. If someone is interested in your product or your service, we want to get them to the best place for them to learn more, take action, and become an active lead as soon as possible. You don’t ever send anyone to your homepage when it comes to online marketing. You send them to something to where they’re specifically interested. Readers, don’t think that asking for email and telephone numbers will create resistance. The reality is if somebody needs to talk to you, they will gladly provide that information. Put yourself in the mindset of somebody who’s eager to do business with you. People are begging to buy from you. Let them do so. I think Richard Koch came up with the 80/20 Principle. That’s where the Pareto Principle came from. He was an Italian economist in the late 1800s. I’ve heard that principle. I just didn’t know the exact history of it. If you think about the whole 80/20 principle, if you’ve got 1,000 visitors who come to your website every single month, 80% of those are going to be casual browsers who are not going to be interested. 20% of those are in an active shopping mode. We have to focus on that 20% and make sure that we serve them. Of those 1,000 people, 200 may be interested and may fill out your lead generation form. Of those 200 who are casually interested, you can then apply that 80/20 to that 200. Of those 200 people, 40 of those people are highly interested and high prospects. Those people will gladly fill out your form. They will give you their phone number, so you can get on the phone with them and sell them something. You’re not targeting those thousand people visiting your website every month, you’re targeting that 20%. Then of those, you’re going to close the 20% of that 20% and you can take that principle infinitely deeper into that 20% of that 20% of that 20% who are probably going to buy your high-value stuff. It’s fascinating when you break down the 80/20 rule and we talked about that extensively with Perry Marshall on an earlier version of the show. You might want to go read that. This is a great example of applying that 80/20 rule to paid marketing and understanding how the returns are going to come. When it comes to disruptive digital marketing number one, you’ve got to have a website which is up to date, secure, mobile-friendly, and fast. The number two, you’ve got to productize your knowledge. People are begging to buy from you, make sure your knowledge is available for them to do so. Next is you’ve got to generate leads. Once you have all those things in place, you want to create a way for people to swap information for reaching out and being able to reach out and trigger that conversation with them. Number four is content marketing. Consistent content cadence creates customer confidence and you’re willing to steal that. I consider that the six C’s of consistent cadence. Number five is when all those things are in play, then and only then should you buy ads to drive traffic to your site. 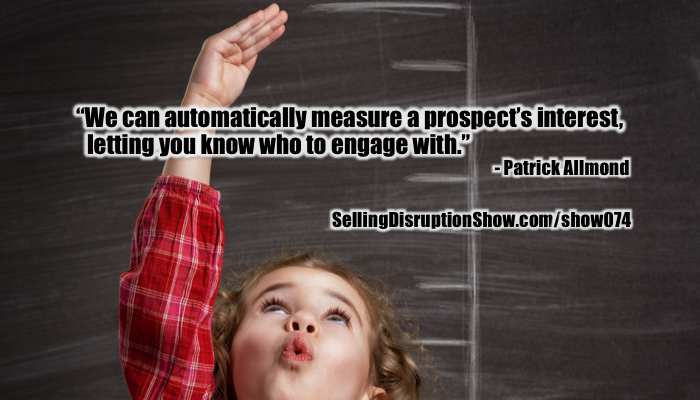 Patrick, how do people get ahold of you if they want to engage with you and focus on digital marketing? You can search my name on the Internet. You’re going to find me all over the place. It’s Patrick Allmond. You’re going to find all my social media channels as well as my main website. Our main consulting website is AllAboutFocus.com. It’s a pretty simple website. I’m doing lead generation on there so don’t be surprised if I pop up and ask you for some information. We have a podcast also. We have an active YouTube channel. Thank you for sharing your wisdom with my readers. Also, thank you for keeping me on the straight narrow when it comes to my digital marketing, my marketing automation and all things web. You’re a guy who takes action with information and that’s something else your readers should pay attention to. Once you have all this information from Mark and the other experts, make sure that you take a pause from your content consumption every now and then and put this stuff into action. It will produce wonders for your business. 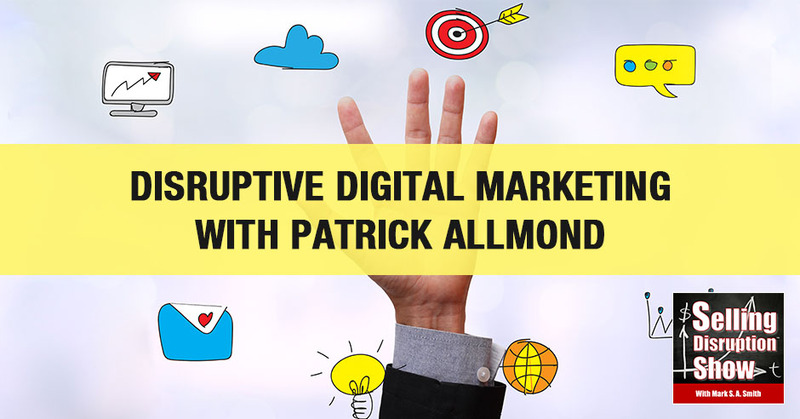 Patrick Allmond is a 17 year veteran of the business world and creator of the “Own Your Empire” marketing system, his own unique structured way of achieving success in the digital marketing world. Business owners come to Patrick to learn how to be rockstar marketers in their industry using the internet for lead generation, digital TV, social media and email marketing. In addition to consulting he travels the country speaking at events showing people how to generate results so they don’t waste their time or money. He is a also a frequent television contributor on ABC/CBS/NBC/FOX, has a weekly web TV and radio series, and writer for SUCCESS magazine.